If you’re looking to buy new house from a developer in the Grange or elsewhere here are a few things to know if you are buying…. 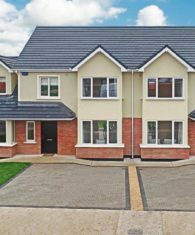 There are plenty of new homes for sale across Limerick city which is good news for anyone looking to buy a house. On the Limerick Leader website today is this article on new homes for sale in the Grange, Raheen, Limerick, being sold by G.V.M. Auctioneers. It’s great to see lots of building activity around Limerick City after a very quiet decade with virtually nothing new being built. In the last 12 months I’m finally seeing adverts in the local newspapers for new housing developments. If you wish to avail of the Help to Buy Scheme you need to act quickly as it is likely to be scrapped at some point soon. You’ll need to retain an Engineer to carry out a Snag List to ensure that the house is fully completed as per the Specification in your Contract. Retain him/her to carry out an initial inspection and then a follow up to ensure each and every item on the Snag was actually actioned. Make sure to budget for your Stamp Duty and Land Registry costs. They account for a large part of the total cost of buying a house. Arrange your finance with the bank before you sign a Contract. Retain the services of a solicitor to carry out the legal work. The legal work related to buying a house is known as conveyancing. If you need a quote for conveyancing then feel free to contact me. brian@moloney-solicitors.ie I’m based in Limerick City and can meet you at a time convenient to you. Brian Moloney is the Principal Solicitor and founder of Moloney Solicitors. Brian qualified as a Solicitor in 2008. He is also a Trade Mark Attorney and is registered with the Irish Patents Office and the European Intellectual Property Office. Brian is a graduate of the University of Limerick and also attended Copenhagen Business School.